Established in the late 1700's, Cobourg Ontario became a busy administrative centre by the mid 1800's. Around the beginning of the 19th century, Cobourg had become a popular holiday destination for Americans. Its harbour also developed into an important commercial centre. The Town of Cobourg Ontario operates a first class marina. A cruising sailor will find all of their needs met in and around the marina facilities. Located in the centre of the downtown, there is easy access to all of Cobourg's amentities. The annual Waterfront Festival brings sailors from far and wide to enjoy what this delightful town has to offer. This is an excellent location to plan to stopover and visit. The approaches to Cobourg harbour are clear from all directions with one note of caution. PETER ROCK lies to the west of Cobourg, approximately 3 nm and approximately 3/4 nm offshore. DO NOT PASS BETWEEN Peter Rock and the coastline. Give it a wide berth as there is a rocky shoal that extends from the shoreline out into the lake. There is a large water tower and a chimney visible from well offshore as you approach the harbour. Closer in, the cupola of Victoria Hall is visible immediately north of the harbour. The harbour entrance is from the southeast and is marked by an ISO RED light mounted on a 15m tower. A FL GREEN light on a tower marks the end of the SW pier at the entrance. This full service marina is operated by the Town of Cobourg Ontario. It is a large, well-kept marina with approxiamtely 60 transient slips available. Fuel (Diesel & Gas), water, power and pumpout are available. Other amenities incluse squeaky-clean washrooms and showers, laundry, picnic and BBQ areas. Internet access is available.A free morning coffee, courtesy of the Town of Cobourg is hot and fresh each morning and the marina has bicycles and shopping carts that you can borrow to use around town. Vessels can also tie up along any of the seawalls. A separate pier is set aside for the permanent Canadian Coast Guard unit stationed in Cobourg (behind the ISO Green). CYC is located within the marina basin. A well-run yacht club, it has a lovely clubhouse with a very inviting fireplace lounge and a great upper deck overlooking the inner harbour. The club has washrooms and shower facilities available, as well as picnic and BBQ areas. The club lounge and facilities are open to visiting sailors. SW of the marina is a large anchorage area offering excellent holding. Big Lake Boats is a dryland marina located within walking distance of the marina. It is a full-service marina repair business able to service diesel and gas engines, carry out basic fibreglass repairs and electrical and prop work. They have a well-stocked chandlery as well. They have a mobile maintenance service which will come to your boat. Bruce and Rick's Esso is a service station that will send a mechanic during regular business hours to work on engine and electrical problems. Cobourg Canvas & Upholstery makes and repairs boat tops, canvas kit and upholstery. It is located 2 mi/3 km from the harbour. They will also come to the marina to carry out repairs. Dean Marine is a large, well-stocked chandlery located very close to the marina. 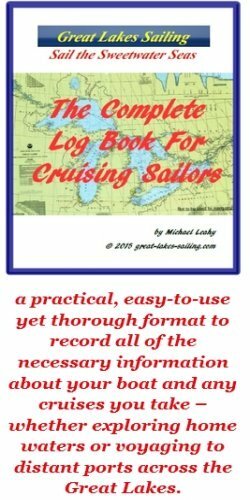 It shares the same site as Big Lake Boats It carries a full line of charts, electronics, hardware, clothing and gift items. Metro is a large, well-stocked supermarket is located about 2 mi/3.5 km from the marina. CIBC bank is located a few blocks from the marina. It has counter service and ATMs. Cobourg has a full range of medical services. The regional hospital is Northumberland Hills Hospital (905) 372-6811. Five medical clinics are located around the town. There are a number of doctor's offices and specialty services. There are a number of pharmacies in town, including Shoppers Drug Mart (905-372-3333) within walking distance of the marina. The Cat & The Fiddle is a tradition in Cobourg Ontario. It carries a number of imported beers on tap and offers typical English pub fare in an inviting atmosphere. Buttermilk Cafe is well-known for its breakfasts and is popular with local residents - always a good sign. Harden & Huyse is NOT to be missed if there is a chocolate addict on your crew (as there is on mine!). This is a family-run chocolatier that specializes in Belgian chocolate (their heritage). Take our word for it - their chocolate creations are mouth-watering! The service is first-rate and very friendly. Whats even better is that they are located steps from the marina. The Matterhorn specializes in a Swiss-themed menu. Schnitzels are high on the list of specialties. As for desserts, all I can say is 'leave room'! The Northside Restaurant is a well-regarded upscale dining establishment in Cobourg. It features a wide assortment of tapas and an extensive wine list. The Oasis Bar & Grill is a long-time favourite in Cobourg. Featuring live music on Wednesdays and Sundays, its patio is usually filled. The menu features a broad selection of salads, seafood, beef and pasta dishes. At the marina, there is an 'information wall' with lots of tips on things to do and see around Cobourg. There is also a tourist kiosk in front of Victoria Hall. Victoria Hall was built in 1860 and the magnificent hall serves as an important venue for musicians and artists - both local and touring. Close to the marina, its worth checking to see whats playing..
Victoria Hall also serves as Cobourg Ontario 's administrative and legal centre and its courtroom is modeled on England's famous 'Old Bailey' courtroom. A historical walking tour will showcase some of the over 500 heritage buildings in this town. The Cobourg Ontario tourism site is an excellent site to discover the many things you can enjoy in this lovely town.